How was your Easter weekend? Ours was pretty good. We were busy, but that seems to be the story of our lives lately. Friday after work, Rory and I headed up to Mt. 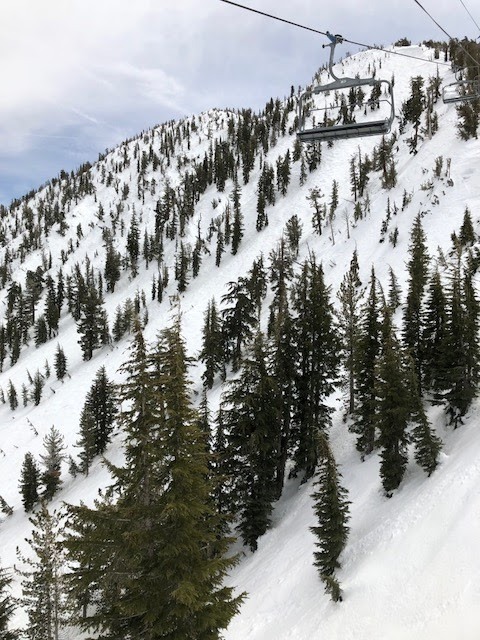 Rose to get a Spring skiing day in. 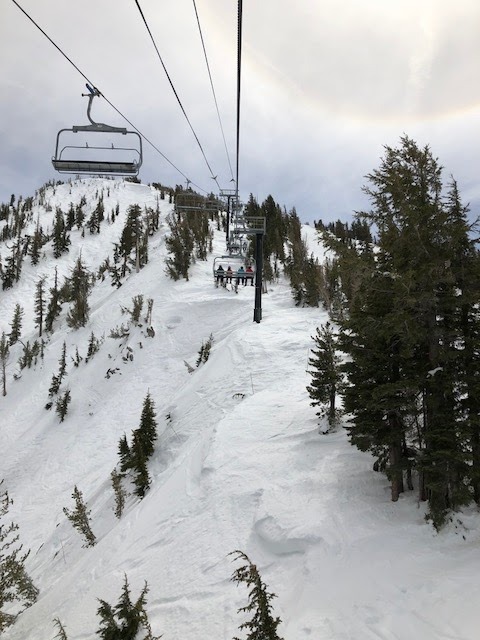 It was 72 in Reno which meant it was in the mid 50s to low 60s on the mountain. The snow was slushy and a good time was had by all. We even stopped half way through for a glass of wine for me and a bloody mary for Rory. We left around 4 pm even though I could have went longer. 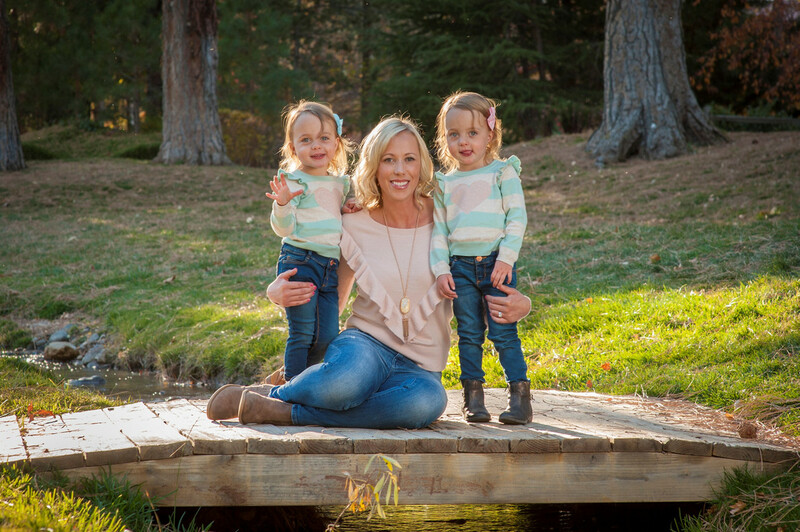 They were open until 7 pm for a ski and wine event, but we had to pick up the girls before the daycare closed. We picked up the girls, went home to take a quick shower and then went out to grab some take-out pizza for dinner. Rory took the girls out on their scooters while I was out and then we ate dinner, watched the rest of Frozen and then the girls went to bed. We went to bed pretty early that night since we were exhausted from the day. 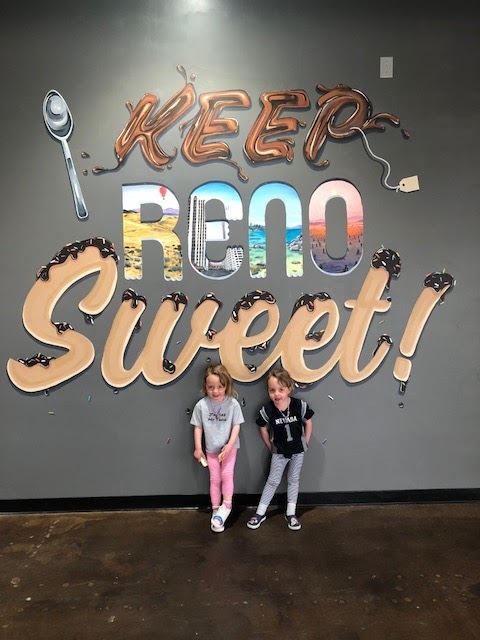 Saturday morning we got up, got ready and headed to our favorite donut shop. 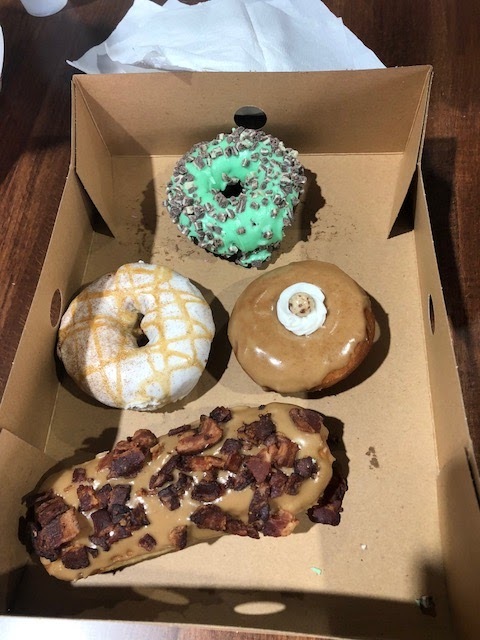 This has been happening a lot on weekends and I could totally get used to it because these are the best donuts. We sipped on our lattes while the girls played in the kids play area. After donuts, we headed to Costco for some essentials and then over to REI to get me a new water bottle for work. Then we headed down to the south part of town to take the girls to their favorite park. The girls played for about an hour to hour and a half before we headed home to eat leftover pizza for lunch. While we were eating, I made hard boiled eggs in the Instant Pot. The girls went down for a nap and I headed out to Whole Foods for groceries for the week. Once I got home, the girls and I dyed eggs using the cool whip method which worked out pretty well. The girls weren't that interested in getting their hands dirty, so I did most of the work, while they watched. After I got my hands dyed from the food coloring, they had no interest in touching the cool whip. Avery also tried the cool whip and hated it. What kid hates whipped cream? Ha. As I finished up the eggs, the girls went outside to help Rory do some yard work. I started prepping dinner which was a lemon garlic butter seared salmon dish that was soooo good. I paired it with artichokes. After dinner, I gave the girls a bath and a trim on their bangs as they were getting in their eyes. We did the whole bedtime routine and then I walked Walter since it was so beautiful outside. 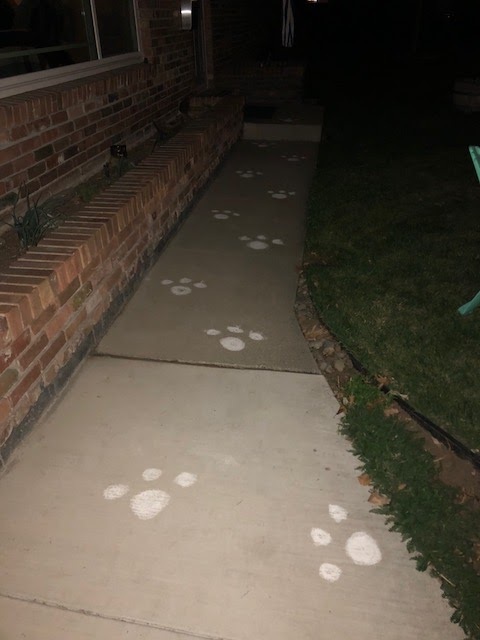 I also went outside to make bunny foot prints for the girls. I also put the girls Easter baskets together and hide eggs. I filled plastic eggs with candy, coins and some were empty. We watched some Silicon Valley to round out the evening and went to bed. Sunday morning I got up early and showered and started getting ready since the girls slept in until 7 am. This never happens and I hope it becomes the norm. 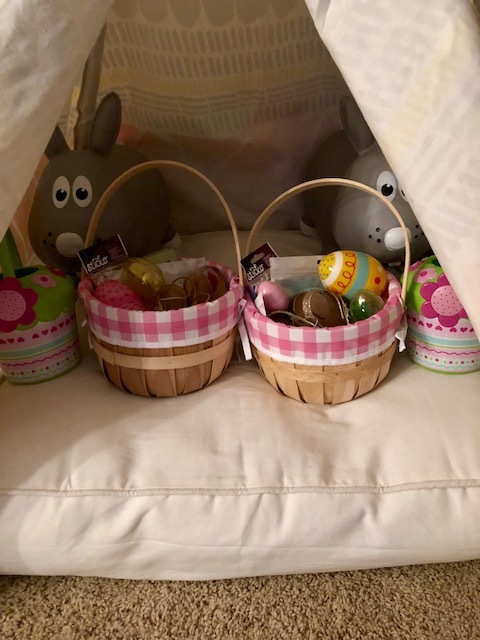 Once the girls got up, we told them the Easter bunny came and there were some surprises out in the living room and dining room. 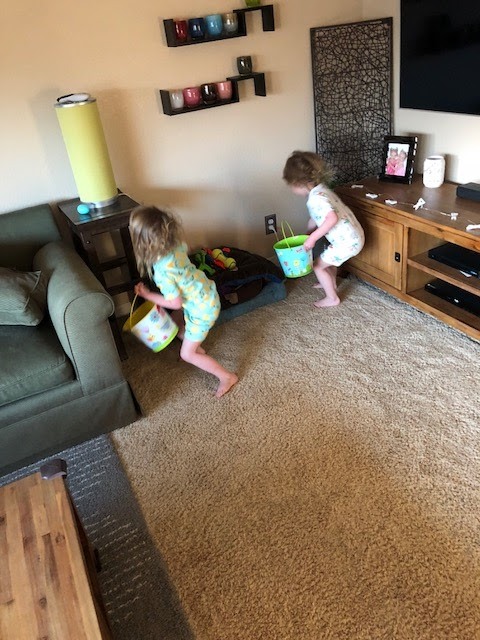 They ran to the living room and grabbed two buckets (that they received last year) and we told them to go find the Easter eggs. 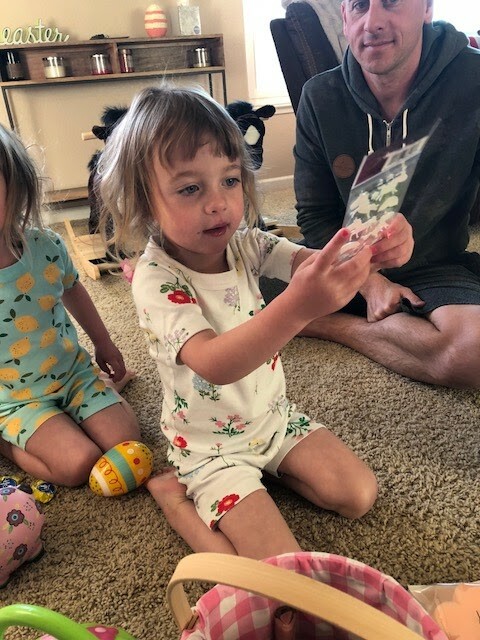 At first they were not sure what to do but once they found one egg, they found all 24 eggs in no time. Then we told them there was another surprise somewhere and they started looking. They found their baskets in the teepee and started going through them. They loved everything. The girls proceeded to eat all of their chocolate and play with all their goodies. Then we finished getting ready and went to brunch with my in-laws. We were able to sit outside since it was beautiful and warm out. After breakfast, we went home where the girls opened some gifts from my in-laws and played with them until noon when we put them down for an early nap. While they napped, I went to the grocery store again for a few other items that Whole Foods didn't have. Then I came home and made the brown butter sage bread crumbs for my dish that I was bringing to Easter dinner. 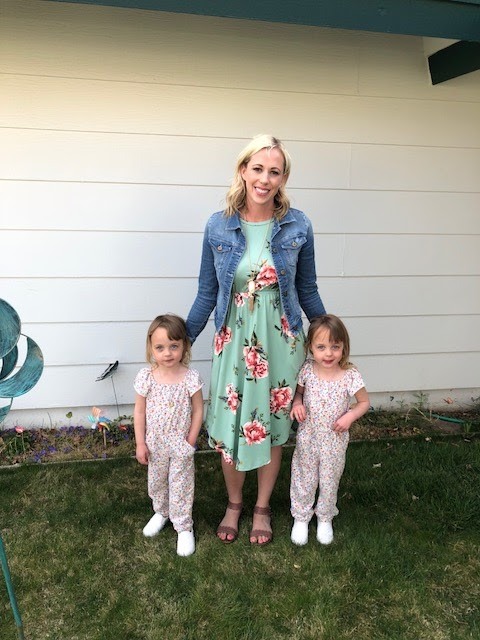 The girls only slept about an hour, so we got them ready and headed to my parents house for Easter dinner. We had lots of family over at my parents house, so we all chatted, did some egg hunting and made dinner. I finished my green beans which we had with bbq chicken, ham, salad, pasta salad, deviled eggs, baked beans and potatoes au gratin. Then we had homemade funfetti cake with lemon frosting. So good and so filling. 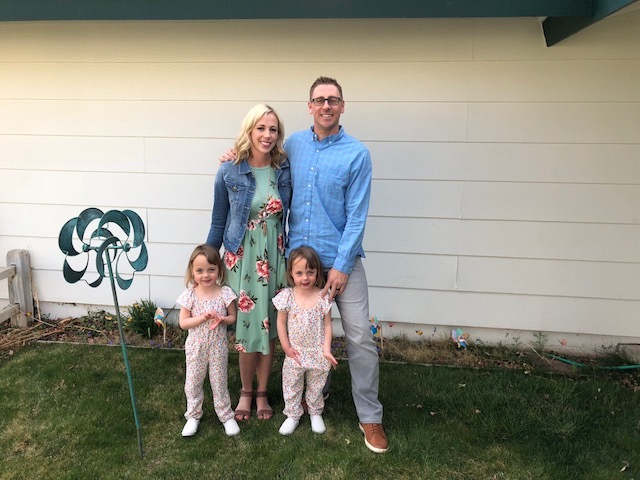 The girls wore their Easter outfits that I mentioned here. After eating it was getting close to 8 pm which is past the girls bedtime, so we headed home. The girls were exhausted and kept asking to go to bed. Once we got home, we put them down and got everything ready for the week ahead. So much goodness....I LOVE your green floral dress... you look beautiful and I spy your new awesome sandals!! The bunny footprints..why did I never think of hat, so brilliant!! 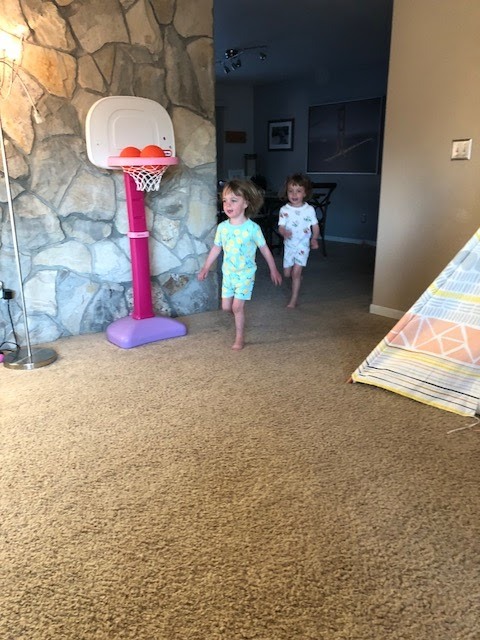 The girls look adorable and how precious they were asking to go to bed; you know that was a day well spent when they are that tired. Thank you. It is from Mindy Mae's Market. I did wear the new sandals and I LOVE them!!! I saw it on Pinterest and the girls loved it. They were sooo tired and so sweet. Love your dress and the girls' jumpers! And just all of this, snow and all. How fun. The eggs look so cool! That is what happened to me last year. 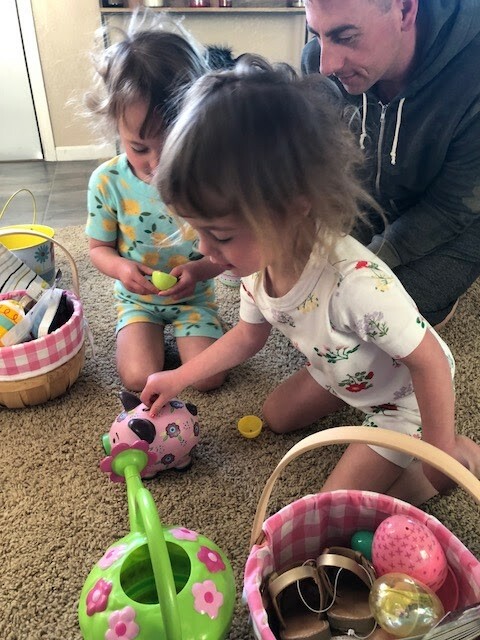 But you are right, my girls didn't notice and barely even hunted eggs. This year, they were all over it. They were soooo happy!!! It was a great weekend! Wow! You guys packed a TON in this weekend!! 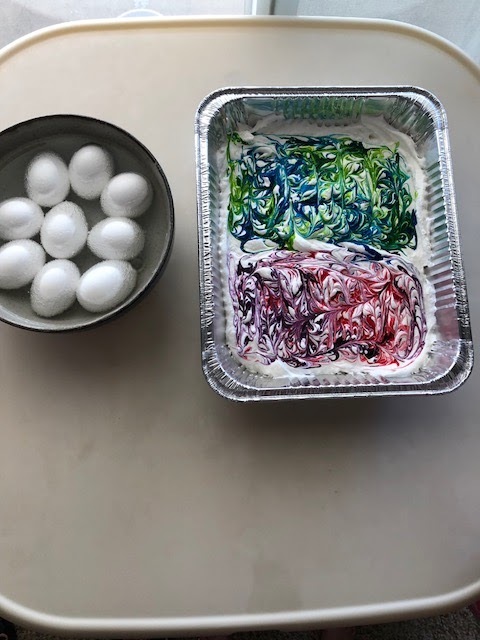 I've never heard of dying eggs in coolwhip but they turned out so good! Ill have to remember that one! You all looked great for Easter!! This pic of one of them in the sunglasses (I can't tell them apart) is too adorable! 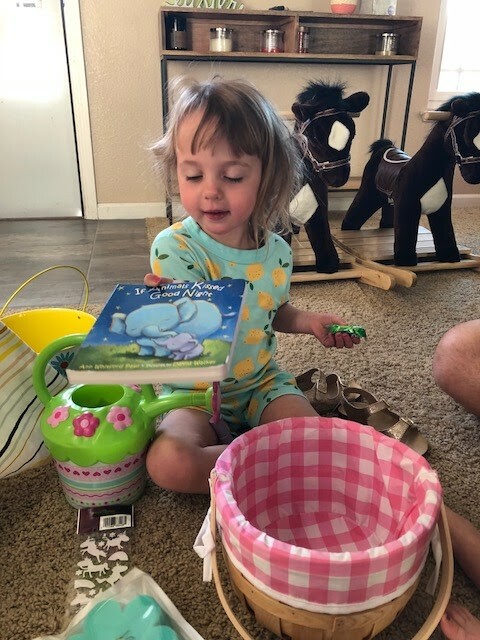 I love all the special Easter things you did for them, they are going to cherish these memories forever! I love your new sandals, they look so good with that dress. That's too funny about the whipped cream! We'll have to try that next year for something different - I love the swirly, soft effect it made. Also love your Easter outfit! So cute! 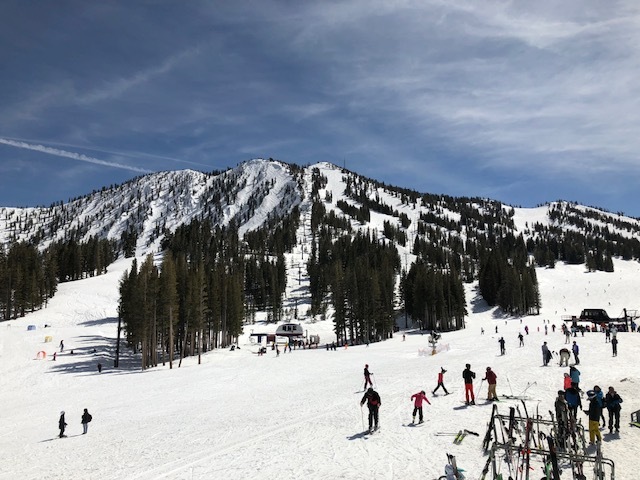 Skiing sounds like so much fun and those donuts! Yes please! I am loving your Easter dress!!!!! So I heard of doing eggs like that with shaving cream but didnt know it worked with whipped cream too! They turned out really cool! So much fun! 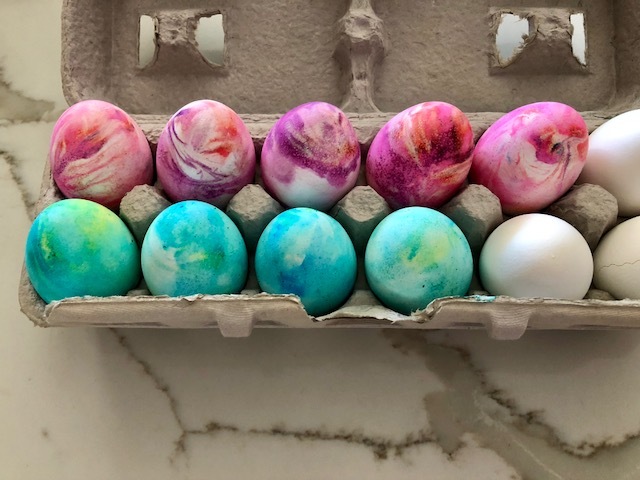 I want to dye eggs like that with the kids next time... so neat! We didn't even dye eggs this year. Too much going on!